In the 2007 A Dog About Town, Englert introduced the narrator, the black Labrador Randolph, the secretly intelligent, overweight, dog detective “with a nose for murder”, and his clueless, superstitious owner, Harry, an artist. They are residents of Manhattan’s Upper West Side who were connected a year earlier by the disappearance of Imogen, Harry’s lover and Randolph’s original owner. The credulous Harry has been searching for her by supernatural means. A Dog About Town is a murder mystery that Randolph solves by investigating, then giving clues disguised as occult messages to Harry, whom he allows to take the credit. During the case they learn that the missing Imogen is heiress of a vast fortune that she may never have known about; and Randolph learns, but does not tell the humans, that Imogen is still alive. The police call in Harry because of evidence that Imogen has been living with the victim – in fact, is the number-one suspect. Harry is incredulous. Randolph, aware that Imogen is among the living, is eager to find her. As before, Randolph narrates in his intellectual, slightly pompous manner. We learn that, when he is not surreptitiously reading Dante, he likes Proust, Dickens, and Joyce. Randolph expects to investigate in the same way as before, by spelling out messages in Alpha-Bits about where “they both” should investigate and letting Harry assume that a friendly poltergeist is helping them out. He is therefore horrified when one of Harry’s quack doctors diagnoses Harry’s leg injury as caused by eating Alpha-Bits, and orders him to throw them out. Worse, Harry now assumes that Imogen has deliberately vanished because she no longer wants to associate with them, so he intends to give up looking for her. He is uninterested when the police learn that the murder victim was a sous-chef at the international dining room of the United Nations, and the boardinghouse where he and Imogen lived is the residence of several low-ranking U.N. staffers. By a happy coincidence Jackson Temple, Harry’s artist friend from the previous book, gets him a commission from the World Artistic Heritage Association to create a mosaic at the United Nations; and the commission requires Harry to work at the U.N. every day until the mosaic is finished. That is fine with Randolph; so is it that Harry gets a laptop computer, which Randolph plans to use as a substitute for the Alpha-Bits (despite having considerably more trouble manipulating the laptop’s keyboard with his clumsy doggy paws and nose). But then Harry’s sister materializes just long enough to dump his spoiled eight-year-old niece Haddy on him to babysit for two weeks. Randolph fears that the hyperactive child will make it impossible for him to use the computer unnoticed, and that being forced to take her with them to the U.N. will put a serious cramp in his ability to investigate while Harry is working. Blinko reveals to Harry (and Randolph) that Imogen is the heiress to a vast fortune in unmined uranium in the outback, and that she has gone on the run to keep agents of several rival unscrupulous governments and megacorporations from forcing her to give it to them. Blinko proposes that they employ Randolph as a fake therapy dog to a neurotic U.N. press attaché to gain the opportunity to investigate. Randolph is pressed into impersonating the Secretary General’s pet, who has just died. I said that A Dog About Town could have been reduced by half without Randolph’s lengthy digressions. Here the padding takes over the novel in the form of all Randolph’s misadventures inside the U.N. Englert is a witty writer and he keeps the reader entertained, but this barely pretends to be a mystery. Only occasionally something exciting will happen to remind us of the plot, as when “diplomat/spies” turn out to be real spies, and a poet is killed by a sniper during a tea party at the same boardinghouse; until the climax when the killer tries to assassinate the Secretary General with a bomb in Randolph’s collar. Imogen resurfaces just long enough to lead Harry and Randolph to the next novel. 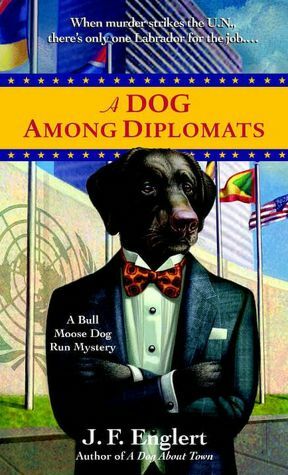 “A Dog Among Diplomats”, by J. L. Englert. NYC, Bantam Dell, May 2008, hardcover $12.98 (305 [+ 16] pages), paperback $6.99, Kindle $6.99. A Dog at Sea begins with Harry, Randolph, and their friend Jackson Temple (and his Guatemalan tree sloth) aboard a pet-friendly cruise ship bound for Curaçao, where the clues to Imogen lead. In fact, the “Nordic Bliss” is on a pet cruise sponsored by Sedadog™, the canine sedative. The ship is filled with dogs and other pets and their owners, and Randolph expects a pleasant voyage full of doggy treats. Unfortunately, the cruise is also full of talk-to-your-animal experts and dog-nutritionists who zero in on the overly-chubby Labrador, and bombard Harry with diet and exercise advice; particularly the ship’s Pet Wellness Compliance Officer. The first human “suicide” goes almost unnoticed by all but Randolph, but the attention focused on him by the canine physical-fitness experts makes it very difficult for him to investigate. As before, the murder-mystery aspect is just a thin thread to connect the humorously eccentric suspects; the sinister stage magician, the pushy car salesman, the obnoxious TV journalist, the Las Vegas hotel detective, the supercilious mystery author, and more. Randolph adopts one of the more intelligent shipboard dogs, Cha Cha the Yorkie, as his assistant. The climactic solving of the murders as they arrive in Curaçao is a sidelight to the reappearance of Imogen and the Happy Ending. 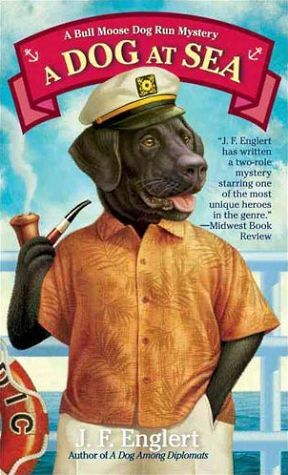 The Bull Moose Dog Run Mystery series is not labeled as a trilogy, but A Dog at Sea is clearly the Grand Finale. It’s been fun, but three novels are enough for this comedic Dog Detective series, and it’s nice that the author knows it. “A Dog at Sea”, by J. L. Englert. NYC, Dell, December 2009, paperback $7.99 (269 pages), Kindle $7.99. Technically, “A Bull Moose Dog Run Mystery” is supposed to be part of the title of Book 3 – but not Books 1 or 2 - but I am going to ignore that.